Summary: The life of a businessman begins to change after he inherits six penguins and transforms his apartment into a winter wonderland while his professional life unravels. Animal-centric movies tend to make ridiculous movies, first for their unwholesome obsessions with animals crammed down our throats, but second for what they ask audiences to believe and accept in the name of animal love. In Mr. Popper's Penguins, “Billy” (Maxwell Perry Cotton) wants to spend more time with his father, “Tom Popper” (Jim Carrey), but dad is always put off with work. Working for a shrewd real estate company as their chief “go get ‘em” bulldog salesman, Potter gets results by getting clients to sell their lands so that they can tear down any existing businesses and rebuild them into mega profit-makers. Like his successful father before him, Popper knows how to push all the right buttons that need to be pushed to make the sale. But you probably can already see where we’re headed. Popper misses out on what matters most in life. His ex-wife, “Amanda” (Carla Gugino) and his pre-teen daughter “Janie” (Madeline Carroll) have the same opinion of business-minded dad as young Billy. They all want more of him. But things change when Popper inherits six penguins. Popper’s normally quiet home-life is suddenly interrupted with squawking and the pitter-pattering of little feet as six penguins take over his 3,200 square-foot New York apartment, and for some reason (despite not wanting them), Popper just can’t get rid of them like any normal person would. Popper has serious trouble putting his work-life on hold to begin with, but now, he must focus on putting aside his unwelcome guests to close one more huge deal that needs closing. Popper must get “Mrs. Van Gundy” (Angela Lansbury) to sell her estate or he’s out of a job. So Popper has an uphill battle; his penguin guests teach him how to be more caring and kind and to put family first, but this is at the expense of making a crucial sale—and at the expense of losing his sanity. These penguins follow him everywhere and the family loves them to death. Even when Popper’s apartment becomes an icebox to accommodate these creatures and everyone has to wear coats and blankets just to get up and use the bathroom, they continue to love them and want them around. When daddy has a momentary recurrence of sanity and decides to give the penguins to the zoo, the family berates him and calls him cruel. We should all know by now that a character exhibiting common sense toward animals (as in, say, not letting them in the house, etc) is unthinkable in an animal movie. To treat an animal like an animal makes one Hitler. Meanwhile, Popper's ex-wife is taking on a relationship with another man. Daughter has boy issues and son needs a good available dad. The family is in turmoil and needs a caring man. What can be done? Why, bring animals back into the picture, of course! I’m thinking that this film, paced without enough consideration for its younger audience members, is almost worse than actually having six penguins traipsing around your house right now. The number of accidents and penguin excretory incidents alone that are supposed to be funny turn out to be stupider than we’d expect—a factor made worse when we realize that these penguins never go very far towards winning over our hearts. This was probably because the penguins never got enough screentime, but that is what happens with non-animated penguins because when not talking or assuming a larger role, nobody wants to see them for longer than a few seconds. 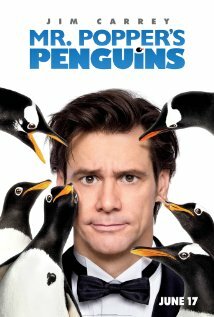 The plot of Mr. Popper’s Penguins is a lot like that of Carrey’s Liar, Liar (1997), only this film is far less impactful or entertaining. But the real idiocy of this crappy animal/family movie is not it’s strong-arming attempt at a moral message, but it’s obsession with these damn penguins. Billy and Janie love these penguins, as does Amanda. And when Popper starts to lose it and turns his high-end apartment into a winter wonderland of actual hills of ice and snow, they don’t think anything is wrong at all. But the kicker: no one for a moment wonders how snow and ice can even be kept in this apartment, seeing as AC units for residences don’t generally have the capability to keep the climate under 32 Fahrenheit like a meat locker. This is one of the most misaligned family efforts of the year. It will be a surprise to find anyone who can overlook its nonsense and truly enjoy it. The humor is there, but awfully limited. And even Jim Carrie’s antics (of which there are few) can’t do much to save it.